Today’s post comes from Jennifer of Firecracker, and is part of a special day of shenanigans from other Pittsburgh Bloggers. You can see my post over on Firecracker, where I am sharing my “Top 5 Places Along the Pittsburgh Marathon Course”. Hey everyone! My name’s Jennifer and I write over at my own blog, Firecracker. I’m so glad to be here posting for Becky today as part of the Pittsburgh Blogger Swap! 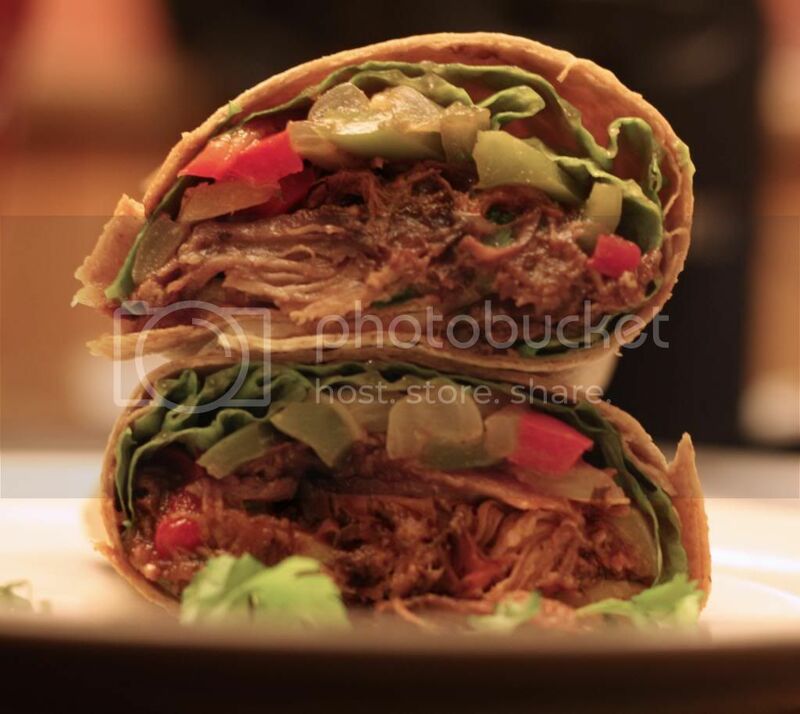 Today I’m going to be sharing a versatile, simple pulled pork recipe that makes my life a heck of a lot easier on a million different levels. First, it’s a time-saver, and with how busy everyone is these days, who can’t appreciate that? You can easily make it ahead and stash it away for later, or you can prep parts of it and throw it together whenever you get a chance. Second, it’s a chameleon: you can make a bunch of different dishes with it–it’s only limited by your imagination. Quesadillas? Check. Sandwiches? Check. Salad? You bet. (Today I’m making a burrito, but really, your options are limitless.) Third, you can eat it and feel good about it: it’s a healthy, well-rounded meal with tons of protein and as many veggies as you want. The star of the show is the barbecue sauce. I’m not ashamed to say that my husband and I were about ready to drink this stuff right out of the mixing bowl (and maybe we kind of did…ahem). It’s tangy and vinegary with a touch of sweetness, but you could always adjust levels of brown sugar, ketchup, and vinegar to suit your tastes. Don’t omit the tomato paste, though: that’s where it gets its thicker texture. Go for a leaner cut of pork, like pork loin—not tenderloin; that tends to be a little more expensive and not as large. You could always use beef or chicken if you prefer. Heck, I bet this would even be great with tofu if that’s more your style—skip the slow cooker, though; just marinate and sear. The brown sugar will make the sauce caramelize beautifully. One thing I suggest, though, is adding additional seasonings after the slow cooker’s worked its magic. In my experience, even though it’s a super convenient way to feed your family, the slow cooker has a way of making things bland. Another thing that’s great about this: the quantities can be adjusted up or down to serve however many people you’re feeding. You’re really just limited to the side of your slow cooker. When I made this, I cut my pork loin in half and stuck just a little over a pound of it into my tiny slow cooker, producing enough for five super-stuffed burritos. This recipe was inspired by one of my favorite South Hills restaurants, Mexi-Casa. Ever been there? All I have to say is…GO. Now. Get queso. Personally, I have dreams about their pulled pork fajita burrito. However…inhaling that entire one-pound monster—not to mention the obligatory margaritas—isn’t the most health-conscious of moves, so at least I can make this at home and feel good about it! Oh, and just a note: the ingredient list looks intimidating, but there’s a lot of spices/simple stuff in there. Also, I’m the kind of cook who tends to throw things together haphazardly. Some measurements are approximate, so just taste as you go! Make your barbeque sauce: combine the ketchup, vinegar, brown sugar, tomato paste, Worcestershire sauce, mustard, garlic, salt, paprika, sriracha, and cayenne (if using). Whisk together until smooth. Roughly slice half of the onion and lay it in the bottom of your slow cooker. Put the pork on top, then cover in barbeque sauce. Cover and cook on low for eight hours. When the meat is finished, shred it using two forks, then add cumin, coriander, garlic and onion powders and toss well to combine. Remove meat from cooker and set aside. 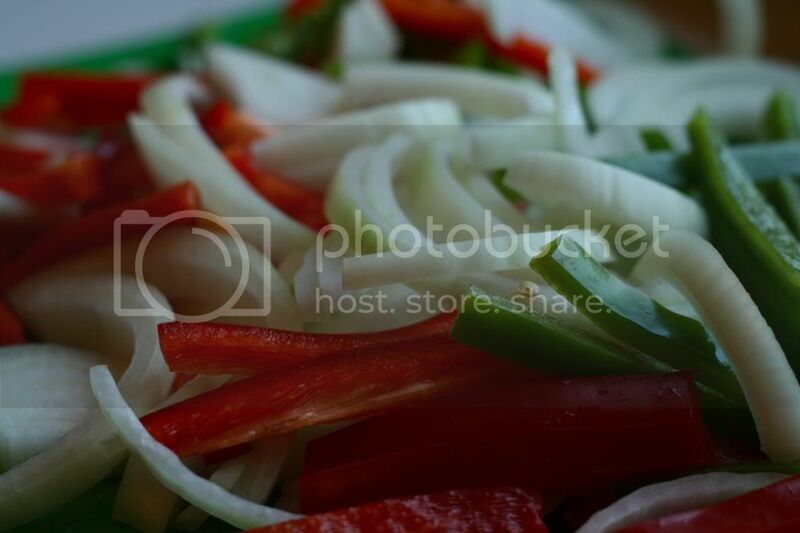 Slice your bell peppers and onions into thin strips. Heat about a tablespoon of oil over medium heat; add the vegetables and begin to saute until softened. Take your time: if things start to burn, turn the heat down. Halfway through the cooking process, add some salt and pepper. Build your burritos: layer the cheese and lettuce on your tortilla. 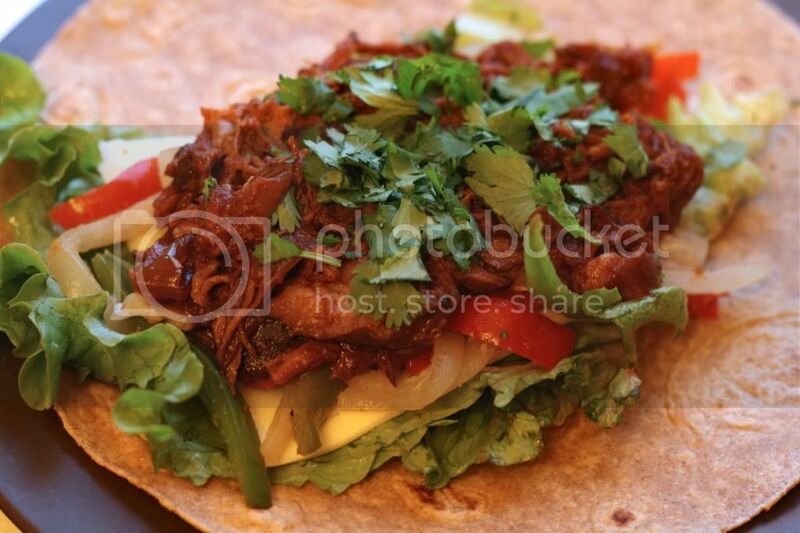 At this point, the pork should have cooked off enough that it won’t rip right through the tortilla. Top with pork, pepper and onion mixture, sliced tomato, and a good bit of cilantro. Roll everything up and serve with a side of sour cream, guacamole, salsa, or queso. Enjoy! Want to check out the other bloggers participating today? Here’s the list, and you can also follow along on Twitter with our hashtag, #PghGBE! 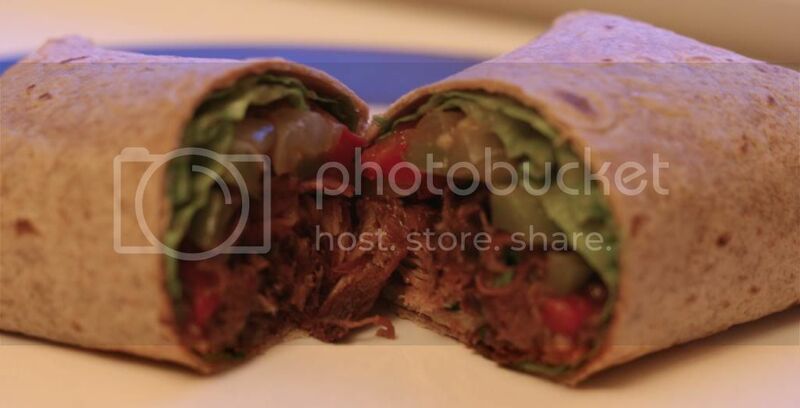 This entry was posted in Dinners, Foodie Stuff, Healthier Choices and tagged burrito, pork, recipe. Bookmark the permalink.